“That Pillow Guy”, Oleg Lee, has just announced his second annual Father’s Day gifting in New York City. 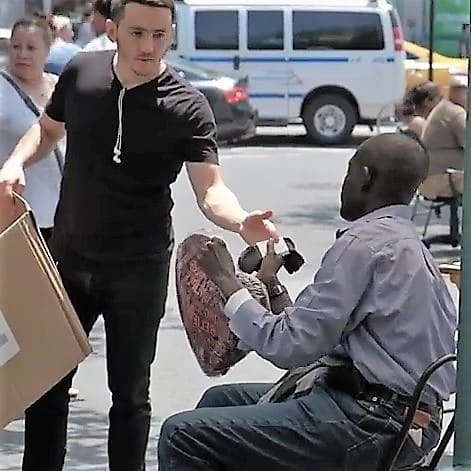 On June 17, 2018 he will be walking the streets of Manhattan and giving away dozens of pillows and supplies to people in need. Last year’s event was a huge success partly due to “That Pillow Guy” partnering with Daymond John (Shark Tank) Blueprint + Co. Daymond sent a team of people to help distribute the pillows last year which took over four hours to deliver two hundred pillows. According to his biography, Oleg Lee was born May 5, 1984 and is known professionally as '''That Pillow Guy. He is an American entrepreneur, inventor, and the creator of Life Like Pillows. That Pillow Guy was born in Tomsk, Russia and raised in Israel. His mother was a waitress and his father was a lumber-mill worker. He dropped out of High School and began his career an an entrepreneur. He is now the world’s most famous custom pillow creator. The pillows have been featured on TV shows such as The View, Good Morning America, and FOX and have been featured on the websites of Daymond John and Business Insider.